MURDER ONE is the fourth novel starring David Sloane, the attorney who does not lose, and is a strong addition to the series. Whether you prefer your fiction to be driven by character or by plot, Robert Dugoni serves up ample portions of both, to make this by far his strongest book to date. In spite of --- or maybe because of --- their past adversarial relationship, Sloane finds himself attracted to Reid, aroused in part by the passion for justice he sees in her, which is so much like his own. Things go upside down, though, when Vasiliev is found murdered, execution-style, in his own home. Reid is ultimately arrested for the crime, based upon evidence that is arguably a bit thin but nonetheless convincing. Reid insists that Sloane defend her, an action that he is reluctant to take due to his inexperience in criminal law matters. Nonetheless, backed by a strong office and research staff, Reid prepares for what may well be the most important case of his career: the defense of the woman with whom he is surely falling in love.It kicks off with Sloane, fresh off a three-month sabbatical for a recharge of his emotional, physical and spiritual batteries following the devastating murder of his wife. While attending a charitable function as the keynote speaker, he encounters Barclay Reid, who was opposing counsel in Sloane's most challenging case. Reid herself is still reeling from a tragedy: the death of her teenage daughter from a drug overdose. Filyp Vasiliev, the Russian drug trafficker who was the source of the narcotics, inexplicably walked away as a free man after a recent trial; Reid, in reaction, is now on a crusade to hold him, and others like him, accountable in civil court. Sloane mounts a vigorous defense on Reid's behalf, but his reach may have at long last exceeded his grasp. The prosecution's team is very good, and their evidence includes Reid's damning statements about the victim, as well as an unlikely but credible witness who puts Reid in the vicinity of the crime on the night of the murder. It appears as if Sloane may lose the one case in which he has the greatest stake of all. But surprises abound both inside and outside the courtroom that causes Sloane to come to an epiphany about his own feelings in the aftermath of his recent tragedy. The heart of MURDER ONE is a tantalizing and puzzling mystery that is put not only to the jury during the trial but to the reader as well: If Reid didn't kill Vasiliev, then who did? As often happens with such matters, Sloane's defense is as much concerned with diverting the jury's attention to another potential perpetrator and away from his client as he is with establishing that his client could not have committed the murder. This he does, leaving the prosecution as well as the reader flatfooted. 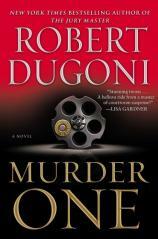 Dugoni, who started off strongly with his debut novel, THE JURY MASTER, and has continued to develop his considerable writing chops with each new work, really pulls out the stops with MURDER ONE, lobbing a series of explosive revelations into the final third of the book, which leaves the reader almost shell-shocked by the end. Sloane, in Dugoni's very capable hands, continues to be a work in progress, changing and developing in small and subtle ways from book to book. To call these novels "courtroom thrillers" would be accurate, but would also give short and ultimately unfair shrift to Sloane's emotional evolution. He may be known as the attorney who does not lose, but in MURDER ONE, that is not entirely true. The ending, while complete in itself, sets up at least one potential scenario for a future book --- one that is sure to have readers coming back for the next installment.